Harry Potter and the Cursed Child is the two-part manuscript of the play currently being performed on the London stage. Though I would have been excited to read it regardless of early reviews, I was happy to hear an overwhelmingly positive response from a friend who was able to see the play in previews about one month before it opened publicly. After reading it, I can easily see what she was talking about: without question given the stage directions and imagining how the production magically whisks through time and from scene to scene, incorporating moving characters in the audience, differences in room temperature, and Voldemort's (that's right, he's back) voice across the loud speakers, this play would be so fun to see performed. I'm not sure how long the play will run in London (I hear mixed reports and predictions), but I hope to get there to see it someday. The story itself centers on Albus Severus Potter, Harry and Ginny's middle child. Picking up with the ending of Harry Potter and the Deathly Hallows and the scene on the train platform nineteen years after the Battle of Hogwarts, we see the familiar faces of Harry and Ginny's family, Ron and Hermoine's family, and Draco's family getting ready to send their kids off to school. 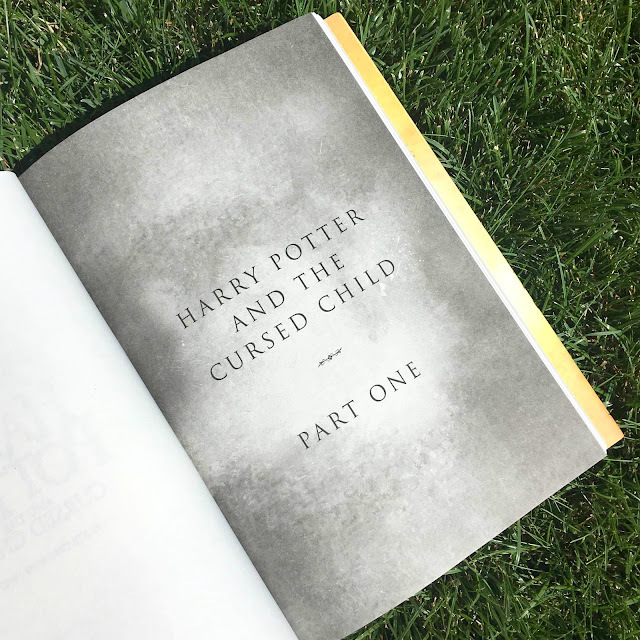 Albus, now eleven, voices his anxieties about entering Hogwarts, the possibility of being sorted into Slytherin, and shows clear evidence of the pressures of being the child of the famed Boy Who Lived. This was not at all surprising. If you'd asked just about any Harry Potter fan six months ago what they thought this play would be about, given the title and the cover they would have predicted the same thing: a story of Harry's child attending Hogwarts and dealing with some sort of anxiety or depression, likely connected to his famous parentage. We were not wrong. Though the premise was predictable, the story that follows has some surprises in store. Perhaps what I was not expecting and maybe liked least about the story, were the liberties with character accuracy that occured throughout the manuscript. If you've read the series you've likely read it more than once, and fans know more than basic Jeopardy!-style answers regarding the characters involved: we know their strengths, their weaknesses, what happened to them then, and we expect to see appropriate continuation and development of these portrayals now. That's not always what happens here and it grated on me a bit. Harry's more abrupt, Ginny's a pushover and less funny, Ron's a complete dolt (and this is true regardless of how he's portrayed in different representations of time), and Dumbledore's portrait shadow is weaker, less helpful, and more prone to emotionally falling apart. This was weird. While other character changes seemed appropriate and plausible (marriage, becoming a parent, and then losing his wife softens Malfoy's exterior), other differences just bugged me. For example, Hermoine and Ron no longer seem compatible at all and the romance between them rings false, and didn't Ron become an Auror? I appreciate why it makes sense for him to join George's joke shop, but his personality has changed and he's just sort of, um, dumb. Did anyone else feel this way? That sounds like a lot of negativity, but if as a reader you can set those things aside and just enjoy the fact that "Hooray! We're getting another Harry Potter story!" then those minor elements won't bother you too long. In part this is due to new characters who pretty awesome. Though Albus is the main character, he's not my favorite. Who is? Enter Draco Malfoy's brainy, humorous, loner son Scorpius. For me, Scorpius makes the play and without him it would crumble. When Albus boards the train with Rose Granger-Weasley and they debate who to sit with and the impact that choice will have on the rest of their time at Hogwarts, Albus can't help but be drawn to this solitary boy who has a dry sense of humor and pocket-loads of candy he'd love to share. Scorpius is funny and has a degree of Hermoine's bookishness. Furthermore, the burden both Scorpius and Albus share helps them bond quickly: as the son of Harry Potter, Albus feels he can't compete, and though he's the son of Draco Malfoy, rumors persist that Scorpius is the secret lovechild of none other than Lord Voldemort. Albus' worst fears come true when he's sorted into Slytherin (much to the surprise of everyone else at Hogwarts), but Scorpius is thrilled to have a geniune friend, something he's never had before. Years pass and while Albus and Scorpius age and show little resemblance to their famous fathers, their sense of social isolation intensifies. One day in an attempt to speak to his son, Harry misspeaks, words are exchanged, and his relationship with Albus seems damaged forever. At the same time, Amos Diggory hears rumor of one last Time-Turner housed by the Minister of Magic (Hermoine) and begs Harry to go back in time and save his son, Cedric. Albus is confused by his father's reasons for refusing to do so and when he meets Delphi, Amos' niece and nurse, she joins Albus and Scorpius in their hare-brained scheme to steal the Time-Turner, alter events in the Triwizard Tournament to ensure Cedric never wins, and in so doing save Cedric and prove themselves to their parents. Unsurprisingly, this all goes terribly, terribly wrong and everyone must band together to save the world from the new Voldemort-run future. As I was reading, I often wondered if out of all of the "please-give-us-more-Harry-Potter" pleas J.K. Rowling heard over the years, the reason this one appealed is because it sort of panders itself to the repeated questions she's pummeled with by fans: Why did Cedric have to die? Couldn't a time-turner have changed everything? Is it possible for Harry and Draco to ever be friends? Was it really the best choice to match Hermoine with Ron? Are prophecies alterable? Does it matter which Hogwarts House you're sorted into? Did Dumbledore love Harry like a son? Could someone have stopped Voldemort before he killed Lily and James and thus prevented everything? Were Bellatrix and Voldemort ever running around together? What if Voldemort had a child? And on and on. Much of the play is an attempt to answer these questions and sort of put those issues to rest. If you're looking for closure, this will do some of that and perhaps lessen questions Rowling gets over and over again, though undoubtedly new ones will also arise. I enjoyed reading play and really look forward to seeing it on stage. Was it as good of a story as I would have liked? No, it wasn't. At times things happen too quickly and far too easily, and though some of that might be forgiven due to the timing necessary in stage performances, it's true that this story isn't as good as the books. That being said and accepted, do yourself a favor and move on. Don't let this dissuade you from enjoying the story, the humor, and the drama of the play itself. It's fun, fast-paced, and high-stakes entertainment and criticism of the play likely suffers from the same criticism of which it tries to warn you: just as Albus is not his father and must learn to be loved and accepted on his own merit, so too is the fact that this play is not the same as J.K. Rowling's books but has its own fun and enjoyment in store. 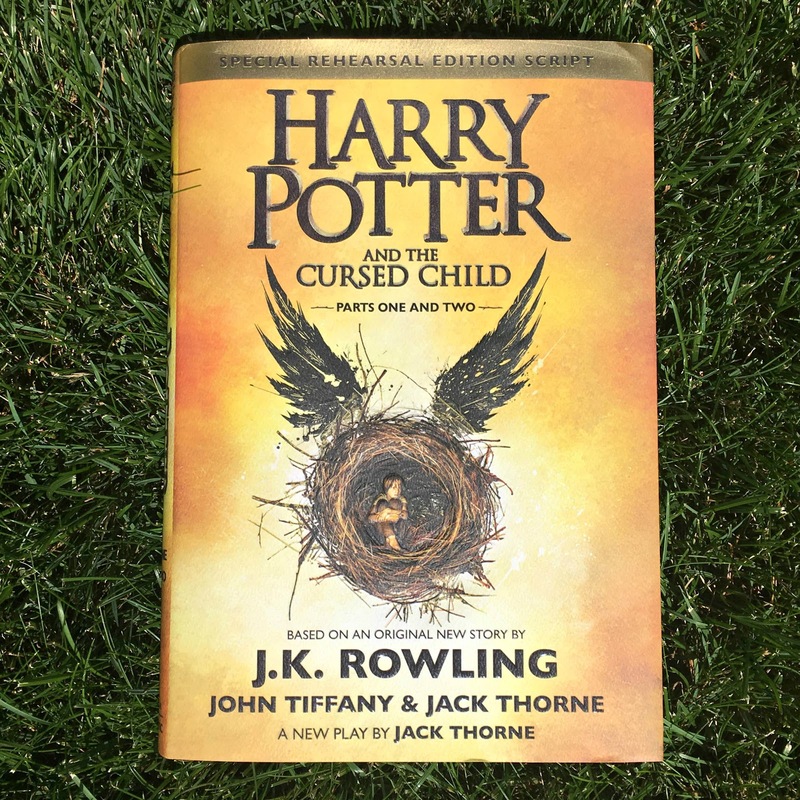 What did you think of Harry Potter and the Cursed Child? Do you plan to try to see it performed on stage? What were your most and least favorite characters, elements, and scenes?